Tag Archives: County Town Books Bedford. Duh duh duh..Another one bites the dust! 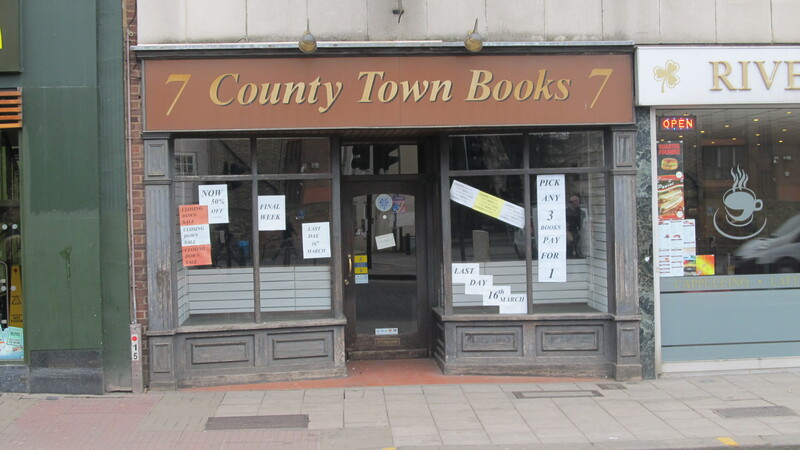 Not really news but there’s another empty shop on the High St, after a long drawn out death County Town Books closed two weeks back. Like many bookshops it was a victim of what I call the Waterstones Effect, people migrate there like beer bellied northerners who think that Benidorm is the nearest thing to paradise. There’s also the internet revolution whereby you can buy you book without having to mingle with people or speak to someone behind the till. And all it can do is get worse! The bookshop itself was old and tired and with every respect to the proprietors they seemed to have seen the end in sight some years ago. A lot of independent bookshops are adapting creatively. One I know and frequent has a regular Tuesday book club, discuss a particular offering not necessarily a new arrival, the last one was Hotel Du Lac but 15 people turned up. The shop opened till eight o clock, a few customers wandered in to see what was going on and bought stuff! I was the only chap there! 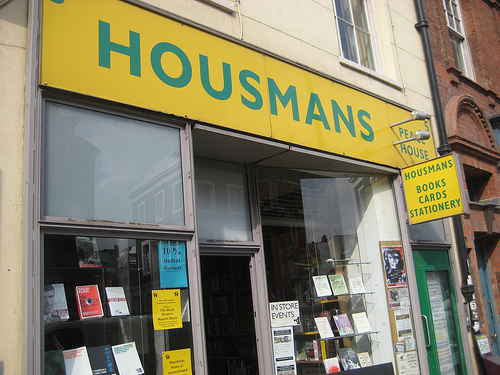 I repeatedly go on about the Housman Bookshop on the Caledonian Rd up from Kings Cross (five minutes at a brisk pace). It’s a specialist place that concentrates on the political arena, global issues, alternative music and counter culture and there’s a nice well informed section on London’s history. I do however blame Nik at teh shop for organising the Laura Oldfield Ford (Savage Messiah) event for the one night I couldn’t mnake it. If I’m in the smoke and don’t get to call in at Housmans and come out with a heavy bag I sort of feel guilty! For me this is heaven, Iain Sinclair can be a bit woolly but anything to do with Arthur Machen and I’m happy, Merlin Coverley is the author of a small tome on Psychogeography. Both sold out but Sarah Wise has written three hugely entertaining books on the forgotten history of London, the slums and graverobbing in The Italian Boy…not nice subject matter but an essential part of London’s past! And that’s that. I now do most of my book buying in London and before I forget I also see Freedom Bookshop as an essential part of a London trip! If I win the lottery I will open a quality bookshop in Bedford. Trouble is I’ve never bought a lottery ticket in my life. I dream of winning the lottery, it doesn’t cost me anything! 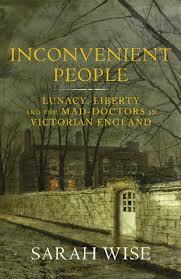 Essential reading for social historians! In the same week that those unknown “town centre chiefs” are once again chalking up how well Bedford is doing and bucking the trend as far as business is concerned, the curse strikes again!Every week at least one town centre business simply vanishes leaving an empty shop behind! County Town books down opposite the market square has been going since 1988 and since Pembertons vanished from Mill St fifteen or more years back its been the only independent book shop in town. Its been in intensive care for some years more so since one of its main sources if custom (university students) dried up when De Montfort upped and went flogging a prime bit of real estate under controversial circumstances. In this respect when I heard that County Town was going I didn’t gasp with shock, I just raised my glass and said cheers as I seemed to be live in there when I was mature student! Now I know that the way we read has been revolutionised with eBooks and so on but I maintain that the hard copy book will always rule supreme. But when we have the all conquering giant Waterstones in a prime spot to soak up all the trade and an army of people content with the latest Jordan book, Dan Brown and John Grisham, little places like County Town Books selling classics old and new will never be able to compete when the purchasing population don’t really give a hoot! So its all our fault. And with it goes a small part of Bedford’s ability to be remotely interesting! Now whenever a new shop opens the Mayors all over it like a rash so lets see if he’ll officiate and help the two owners (shown below) lock the door for the last time in a week or two when they shut up shop! Tags: County Town Books Bedford.